Nothing ruins a fun ATV ride more than getting a flat tire. Any time you goe on a ride, either just for a pleasure cruise or headed to a hunting spot, you need to be prepared (and knowledgeable) for the inevitable. Normally, you don’t pack an extra tire in case of a flat. 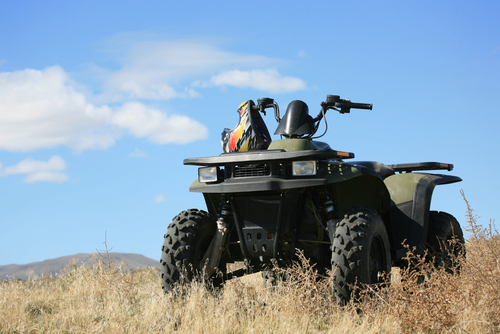 In most cases, ATV riders would equip themselves with a repair kit. There are several types, including plug kits and patch kits. A plug is a temporary fix that can get you to your destination, but should not be relied on as a permanent fix. Patch kits, however, can be. Others may argue that a plug can, in fact, be a permanent solution. If you are unsure, you can always consult a professional. Kits are cheap, and will set you back no more than $5 or $6. 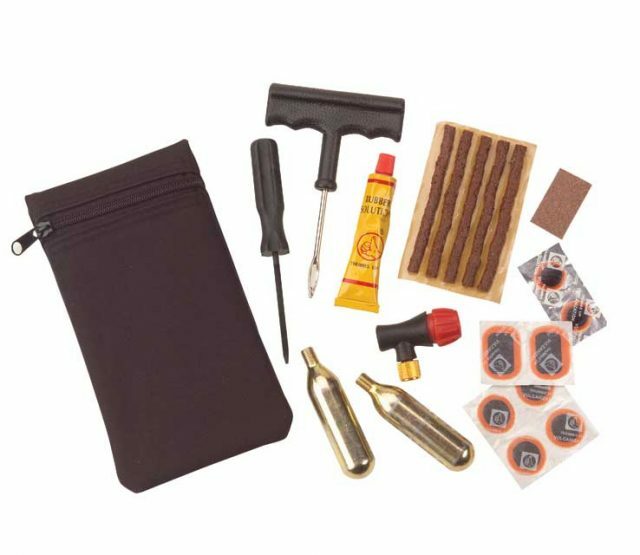 Patch kits come with glue, tube patches and a metal scuffer lid or buffer material, while a plug kit includes a reamer tool, glue/rubber cement and tar-like string. You’ll probably use a good knife or wire cutters, too, which can help you dig and pull out a nail and trim the plug after it is inserted into the hole. There are times the tire is damaged beyond repair, thus going online and finding great OEM replacement tires at sites such as Motosport.com is the route to take. Doing the job yourself can save you money and give you a bit of pride. First and foremost is locating the puncture. Many times it’s pretty easy to spot if there is still an obstruction like a nail or a screw in the picture. But sometimes it’s hard to locate the leak with the naked eye if there isn’t a foreign object sticking out of the tire. In that case, it’s best to air up the tire and spray it with water right after to see if air bubbles are seeping. After marking the leak by placing a piece of tape next to it, remove the obstruction. Sometimes it’s just a matter of unscrewing the screw, but sometimes it may take a little bit of digging with your knife or pulling it out with wire cutters or pliers. Sidewalls generally should not be repaired. Plug kits are only for repairing punctures on the tire tread. Take the file-like tool in your plug kit and jam it into the hole, moving the tool up and down a few times to loosen up the inside. Take one of the tar-like strings and thread it through the eye of the plug tool that looks like a giant needle. Pinch the end of the string to make it fit through the needle and then pull it through so that the string is centered in the plug tool. After coating the string with rubber cement, you take the plug too with the string and insert it into the hole, which will take some effort. Push the plug tool in until only about half an inch is sticking out. Then pull the plug tool straight out and you should have the string now plugging the hole. Use your wire cutters to cut the excess string off. Add a little bit of rubber cement to the top of the plug and let it dry. Once it’s dry, fill the tire up and then spray the plugged spot with water to make sure there are no air bubbles. If there are, you may need to add another coat of rubber cement. If not, you’re done! Patching a tire involves removing the rim from the tire using a tire machine. If you don’t have one, you can use a tire spoon to break the bead free and a tire iron to dismount the tire. After locating and marking the punctured area, use the scuff lid or buffing material to smooth out the damaged area. Be sure the buffed area is large enough for the patch to fit on. Once that is complete, brush a thin layer of vulcanizing fluid to the smoothed out area. Make sure not to use too much to where the fluid pools up or you’ll have trouble keeping the patch on. Let the fluid dry for about 10 minutes. Once the area is dry, remove the protective cover of the patch and line up the plug part of the patch with the hole pushing the pin of the plug slowly into the hole. Continue to push the plug patch into the hole and, if necessary, use pliers to grip the pin from the outside of the tire and pull until the patch is flat with the smoothed area of the tire. Once the plug is all the way through the hole, the pin will come off. Go over the repaired area with your patch roller to remove air bubbles and keep the patch securely sealed to the tire. Trim any excess from the patch as close to the tire as you can. With the patchwork complete, all you need to do then is reinstall the tire.